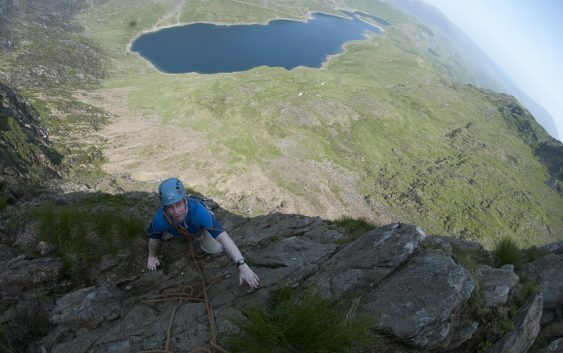 There are many routes and cliffs that make up the early history of rock climbing in the UK, few are as dramatic as Lliwedd. Like any self respecting cliff its history goes back beyond climbers. In Lliwedd’s case to the legend of King Arthur. Where it is said after the King was buried at Bwlch Y Saethau the remainder of his men ascended Lliwedd and climbed down to the cave of youth on Snowdon, which is situated in what we as climbers now call Slanting Gully. They were to wait there until the second coming of the king or as it was a shepherd who was looking for a lost sheep who reached the ledge that led into the cave, as he squeezed in he knocked a bell. The warriors stirred and the shepherd was said to never recover from the shock. So as well as the climbing and exposure on this cliff be sure not to wake the King Arthur’s sleeping army. These massive cliffs were first breached by A.H. Stocker and T.W. Wall in 1883 via a route call Primitive Route, three years before the historic ascent of Napes Needle. If you stand below this buttress you’d be forgiven for thinking that this route is a rock climb. However the rock loosely follows Bilberry Terrace, possibly one of the longest, committing and most sustained scrambles in North Wales and a route that deserves its formidable reputation today. It is however on the boundary of a scramble becoming a rock climb, whilst it is more committing than Napes Needle due to its length it is technically much easier. 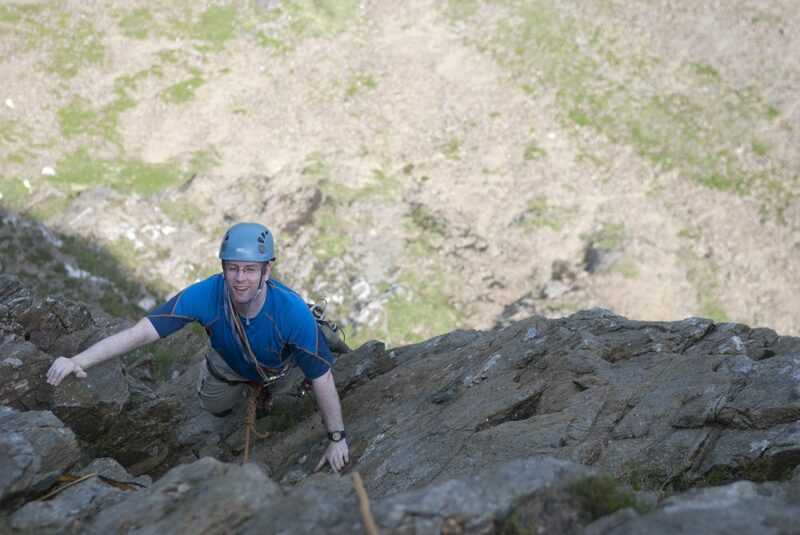 Simon Geering being guided up Avalanche/Red Wall/Longland’s Continuation on Lliwedd. In 1887 Oscar Eckenstein and T.V.Scully added two more routes Central Gully and West Peak Route, the later was confused with Primitive Route. Despite a few repeats, seven year elapse before anyone dare to step onto new ground. Those seven years rather than help the people who repeated the routes to find new lines, instead seemed to add to the myth that only two route existed. Combined with the fact that there had been few unsuccessful attempts on the more formidable East Peak, albeit timid ones. Meant a new legend of the cliffs inaccessibility was being created. It took until 1903 for this myth to be busted, when a J.A. ‘Archer’ Thompson looked across at the crag from Crib Coch. The Easter snows were still lying on the ledges and gave them enough hope that the cliff wasn’t completely unbroken. Despite the melting snow and ice blocking the preferred route an exploration around the centre of the cliff resulted in Route I for the Archer and Oscar Eckenstein, and year later the same pair claimed Route II. Another year later the same team climbed the unimaginatively named Route III, which is now called Horned Crag Route. Archer Thompson continued with his love affair with this great cliff and went onto make the first ascent of Avalanche/Red Wall Route in 1907 with E.S. Reynolds. Which is another classic of the East Buttress although it was straighten out years later by the adding of Longland’s Variation. Whilst this is nowhere near the most sustain route on the cliff it is certainly one of the longest and maintains a level of interest to the Severe grade climber for it’s entire 12 pitches. These are not your usual short pitches but often complete rope lengths between welcome ledges and perches. It is this route that for me captures the spirit of adventure that is still required today for would be ascentionists. Despite the low grades this is no place for novices at over 1000ft high with no easy escape that early reputation is deserved and every year the local rescue team plucks at least one ill prepared team for the cliff, due to yet another benightment or climbers simply becoming lost in a vertical ocean of rock. Although this maybe due to a glitch in one guide that describes Avalanche Route to the great terrace, which is still about four or five pitches short of the top. To the those that have not read all the detail it comes as a shock that there are only just above half way! Why this route is important to the evolution of climbing, is simple. It was one of the times when human survival instinct was overridden for the sense of adventure. This vast and seemingly impenetrable cliff was a red rag to the early pioneers of the sport. Whilst there was a period of time it was consider impossible, it is also seemingly inevitable that these last great problems will eventually be climb. More importantly for the modern climber though it is the kind of crag that is so big and complex that I defy any climber to walk up to the base and not feel slightly giddy. No matter what grade you climb you will very much feel put in your place, a rather insignificant pixel on a great canvas. That to me is why it is special, despite a whole host of modern gear the mountain still has kept a little of that impenetrability and in doing so retains much of its mystique. No topo or description will ever be detailed enough to not have you at some point thinking am I still on route or am I adrift on this sea of rock?